Due to getting distracted with our iStuff last night, we didn’t wake up particularly early! We had a few nibbles in our room and headed off to catch the subway. This morning we were heading to Fushimi Inari, which was a bit unfortunate as the sky was looking very overcast and there was no blue to be seen. Undeterred we headed there anyway, and with even more bad luck the place was packed out with school trips! I guess we picked a popular time for school trips in Japan! This made getting those postcard shots very tricky indeed, but thankfully we overtook them and managed to avoid them for the rest of the afternoon. 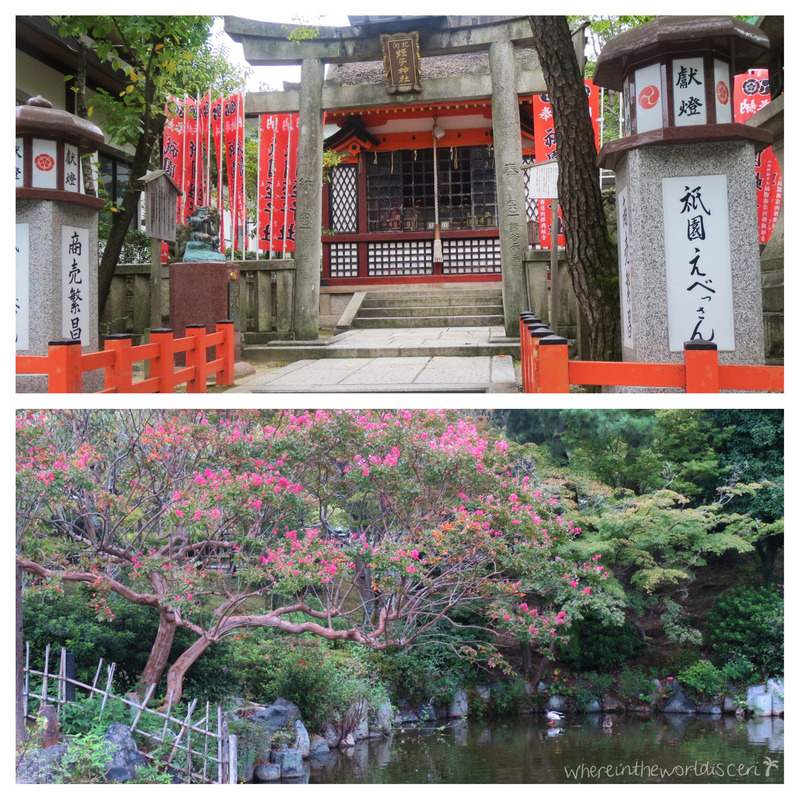 We strolled around the shrines and tori gates, walking around halfway up. 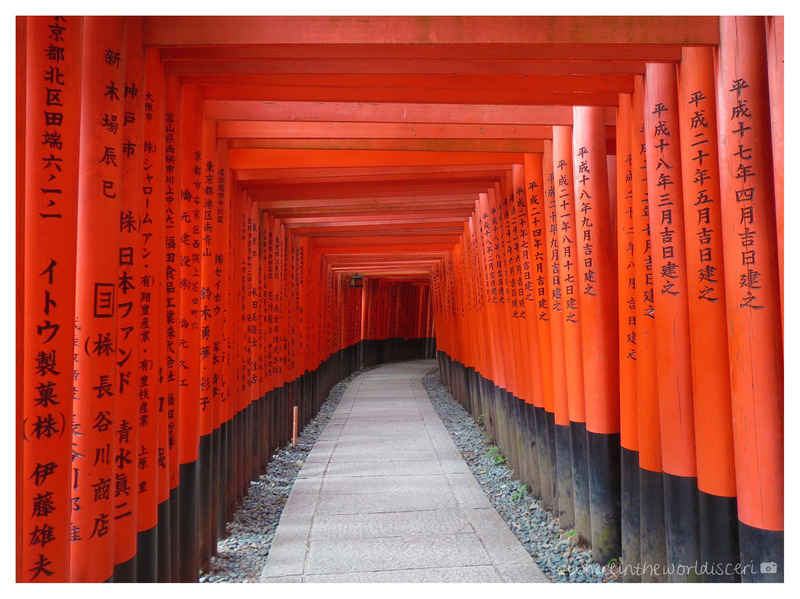 I was surprised how orange they were considering they look so red in most photos and guidebooks – the power of a little photo editing! They were pretty cool to see though, even if orange is my least favourite colour. Afterward we browsed the various stalls selling trinkets and souvenirs, but prices were definitely inflated compared to back in the centre of town. We decided to head to Gion next without any structured plans. Due to this we ended up going doing a lot of walking in a very illogical order, but it was still a fun and productive day. We strolled through Hanami-koji street which was as packed as a festival, but very pretty with lots of ladies walking around in traditional dress. 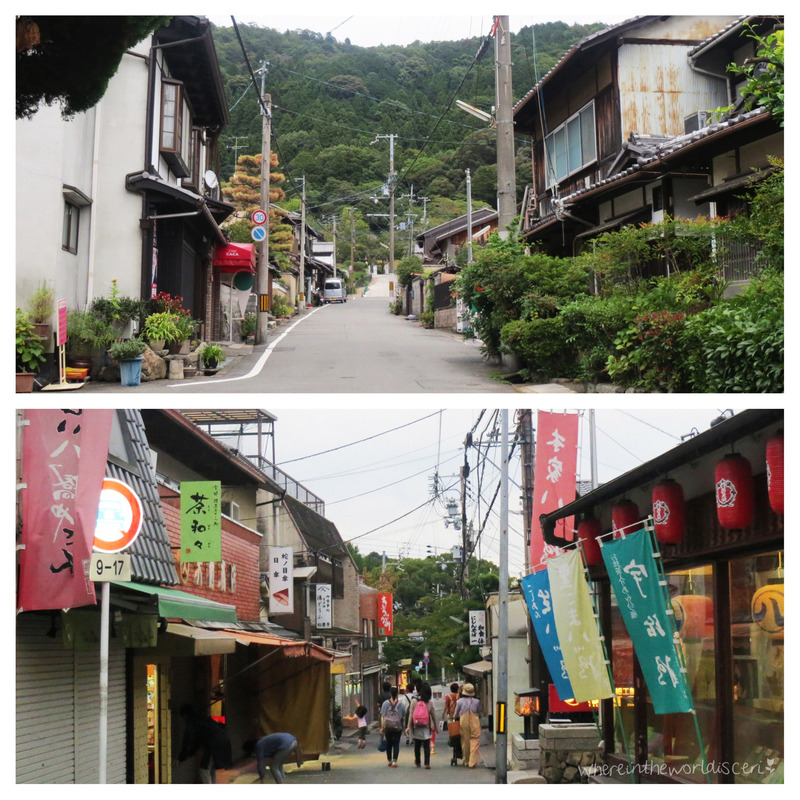 From here we cut through to a shrine/museum and then explored the narrow alleyways for a bit. Once we found our bearings we headed to see Yasaka shrine and Maruyama park. The grey sky meant the pictures were average at best, but it was still interesting to see and there were some freakishly huge fish in one of the ponds which Chris had to get on film with his Go Pro. We decided to sample some ice cream and I opted for the slightly adventurous chestnut whilst Chris remained predictable with his usual chocolate. From here we explored the traditional streets and browsed all of the shops and food items. We picked up a Christmas present for Chris’ mum along the way, a little purse made from Japanese fabric. 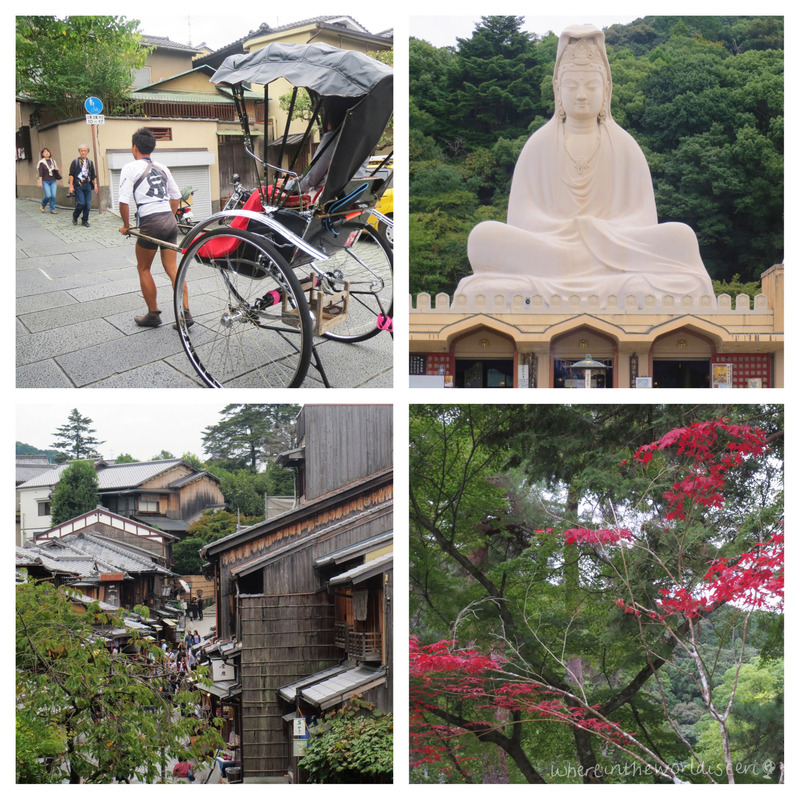 The streets up towards Kiyomizudera temple were heaving again, with yet more school trips! I loved the one school where every kid had to wear a bright banana yellow hat, they didn’t seem too pleased about it! We stopped off at a little café/bakery type place and ordered a beef & potato croquette and a pork curry fried bun to share – these were very naughty and greasy but tasty all the same. We arrived at the temple for a quick visit, but the scaffolding was covering quite a big section. On our way back down the hill we came across some stores selling triangular mochi with a variety of fillings. They were generously handing out samples and we tried chocolate banana, black sesame, cinnamon cookie dough, chestnut and green tea! We would have taken some boxes home if we could, but they had to be eaten within a week so wouldn’t have made it home. 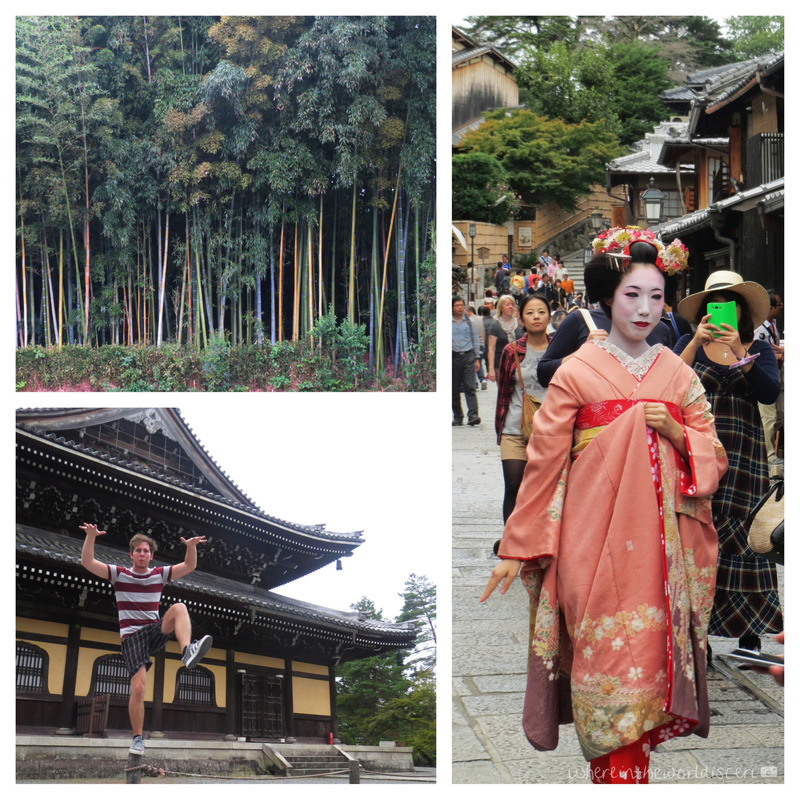 Our next plan was to try and find Nanzen-ji temple, although we weren’t exactly nearby. 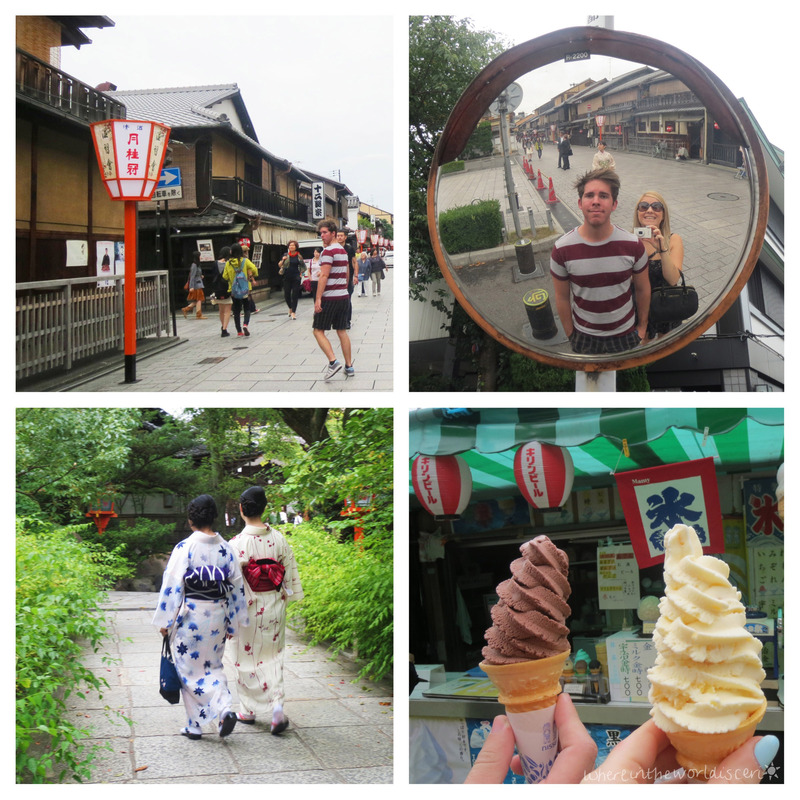 We did most of it on foot catching the subway for one stop between higashiyama and keage to rest our feet briefly. Typically this was where I had a kerfuffle with my subway card, it hadn’t scanned properly on my way in so wasn’t letting me out again. I sweet talked the ticket man and he fixed it for us. Nanzen-ji was a brief walk from here, and yet again the lighting wasn’t on our side! It was a cool temple though and must look amazing in the Autumn. Even though it was approaching 5pm, we decided to take the Philosopher’s path down to Ginkaku-ji. There wasn’t much colour on the trees at this time of year but it was a nice path down the river and we stumbled across some playful cats along the way. We had our power walking feet on but still arrived at Ginkuka-ji just before it closed – typical! Instead we had a browse in the nearby shops, which started closing shortly after so we decided it was time to head off in search of food. We’d been on our feet and on the move for the best part of the day, but decided to push through and walk down to the nearest subway at Demachiyanagi. This was a slight trek, especially with our exhausted feet, and typically we passed a truckload of bicycle rental places on our way which rubbed it in that little bit more. Once we made it to the subway, we headed towards Karasuma-oike to change trains and figure out our plans for dinner. In a moment of madness and bad judgement we decided to visit the Kushiya Monogatari near Kyoto Station. Why we couldn’t just left it at the one visit is beyond me! Once we were there we had another 40 minute wait, surprisingly due to more school groups! I presume it must have been the end of term or something. I didn’t mind this though as it meant I was permitted a quick trip to Daiso around the corner! I stocked up on a few things and impulse bought some cat toys for my fur baby at home. After a speedy browse around some other stores it was time to head back to the restaurant. It was more or less the same as the Tokyo location, with slightly different noodles and no onion on skewers which was one of my personal favourites! DIY onion rings! I tried to make my own from the salad bar but it was a bit of a disaster. We found it was so easy to over-consume at the skewer places due to the novelty factor and the fun element of cooking it yourself. And then there was the dessert.. deep fried mini doughnuts, chocolate fountain, ice cream and cake! This time I didn’t go too crazy with the dessert, but I was fairly certain I’d eaten back all the calories we’d worked off today, and then some! After this dinner we swore we would avoid fried food for the rest of the trip as we waddled back to our hotel room in a food coma. 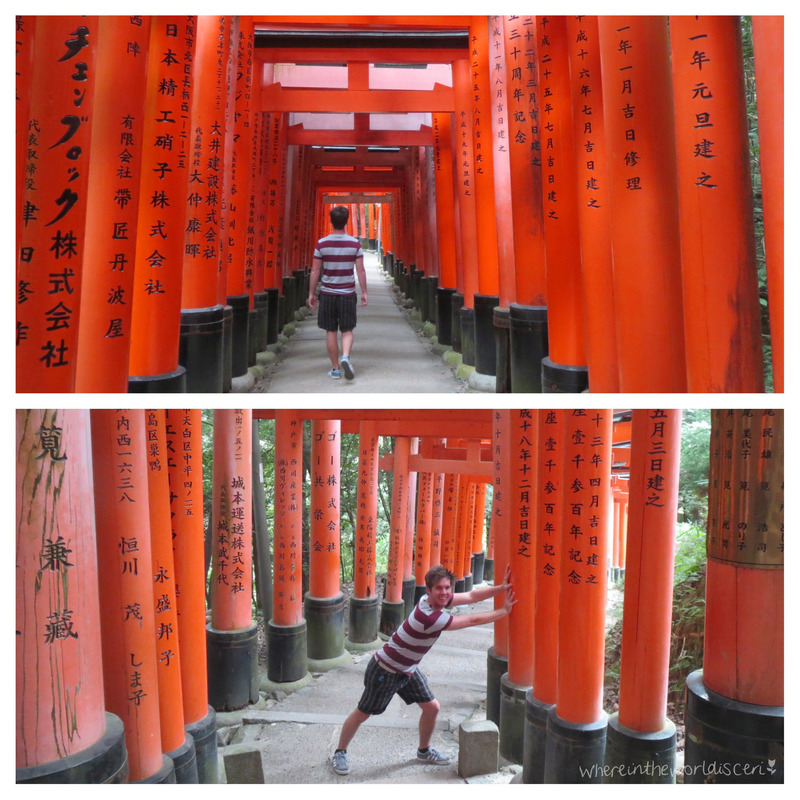 This entry was posted in Japan, Kyoto and tagged food, fushimi inari, gion, japan, japanese food, kushiya monogatari, kyoto, shrine, temple, travel. Bookmark the permalink.